Author: Edited by Denison Jayasooria and K. S. Nathan. Edited by Denison Jayasooria and K. S. Nathan. Institute of Ethnic Studies (KITA), UKM, Malaysia, 2016., pp. 640., ISBN 978-976-0741-20-8. 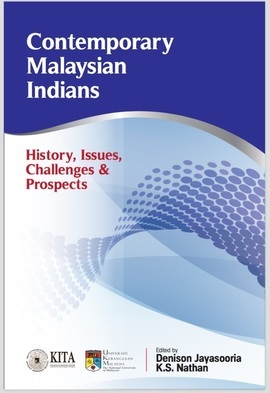 No matter how minuscule the numbers of Malaysian Indians in Malaysia might be, interest on the subject seemed to escalate with every passing year ever since the publication of K. S. Sandhu’sseminal work, Indians in Malaysia (1969) that presented a well-documented account ofthe arrival and settlement of Indians in colonial Malaya. It is quite evident that scholars increasingly chose to develop new stand-points to analyze the subject matter of a minority community in a multi-ethnic nation, characterized as a “repressive-responsive regime” by Harold Crouch (1996).Thisbook is an outcome of such an effort to bring forth a new paradigm in understanding the current socio-economic profile of Malaysian-Indians by keeping in view, as per its assertion, the ‘bottom 40%’ as the target group. The editors have done a marvelous job in bringing together the most noted scholarship of the day on the subject within the confines of twenty nine issue-specific chapters which have been sequentially arranged under seven themes. Given the fact that Malaysia was not built in a day, the chapters as per the introductory theme, makes an effort to familiarize the reader with the pre-colonial as well as colonial roots of modern Malaysia, which inevitably brings in the issue of Indian immigration, their settlement, mostly as plantation labourers and seldom as a part of the capitalist class like the Chettiars of South India, their participation in the economic growth and their subsequent role in the nation building process. There runs a common strain of displeasure in the writings at the lack of adequate recognition as well as attention with regard to the government policies towards the role that Indians had always and still continue to play in the development of Malaysia. It is often debated that Malaysian Indians have fared the worst as a consequence of the affirmative action undertaken through the New Economic Policy of 1971, and both Edward T. Gomez and Mahalingam Marimuthu leave no stone unturned in establishing this point time and again. In fact, their individual take on the subject of political economy of the state finds statistical as well as factual resonance with the truth that simultaneous implementation of ‘developmental state’ policies along with the ‘neo-liberal’ economic model has not produced the desired result of eradicating poverty or reducing inter-ethnic income disparities. Moreover, the goal of ‘inclusive development’ as per UNDP 2014 definition remains a mirage for the bottom 40% of Indians, who instead of having been included in the policy formulation-implementation process, are actually suffering from lack of documents that could invalidate their citizenship status in the first place. Yet,as N. Siva Subramaniam and M. Thanasagaransuggest, there seems to be a silver lining now that steps in the right direction are underway as a result of putting into practice the experience of the Special Task Force that was constituted in 2010 in order to help these Indians to obtain identity documents. Several authors have made good use of the available statistical resources for a deep understanding of the Indian problem as the book suggests. Rama Ramanathan for example, has presented a compilation of demographic data that could very well be considered suffice for the socio-economic profiling of the Indian community. Yet, at the same time, it seems quite apt to put into question the intentions of the government who, having armed with so much information haven’t seemed to have made much progress at empowering the Indians. A different dimension has been sought to look into this question through the paradigm of rights and freedom given to be exercised in the capacity of citizens as well. It must be mentioned in this context that Tamils, having constituted nearly 80% of the migrating masses to Malayan Peninsula naturally become the cynosure of the academic discourses where Malaysian Indians are concerned.Interestingly enough, the book exhibits the novelty of putting forward a separate theme dedicated to the Telugu as well as the Sikh communities, aptly categorized as ‘sub-ethnic Indian communities’, by some of the most prolific authorities like Sarjit S. Gill, on the subject. However, as Nathan points out at the very beginning, the anthology is not just about pinpointing problems that affect the urban Indian poor or lamenting the neglect of Malaysian Indians at the hands of the very government they serve. It also aspires to become a beacon of hope for the community by making the administration aware of the pressing needs of the day and offering possible ways out to the same. Hence, the suggestion for a necessary revision of the ‘New Economic Model’ towards a fresh take on poverty eradication which is to simply transgress the boundaries of ethnic division and putting the development of ‘Malaysia’ ahead of just Malays. One is also sure to agree with the fact that ‘inclusiveness’ as an objective could be made a success only through the proper realization of the concerted efforts of both the civil society along with the government on various levels of policy-making and its implementation. It re-asserts the importance of the youth and its education, both vocational as well as holistic, for the up-liftment and progress of a community. On a concluding note, the contributions surely deserves an applause for shedding light on some of the most relevant yet lesser-discussed aspects of the Indian community, especially the latter themes that highlight the development agenda at the grass-root level of the society encompassing the active participation of women in addition to the encouragement to small and medium enterprises that could very well prove to be an empowering tool for the community in the near future as has been evident in some other developing nations of late. There is still a small lacuna considering that nowhere do the government to government interactions between India and Malaysia find a mention as well as policy outcomes on this issue as a result of the bilateral understandings. This is especially significant in the light of the ‘Act East Policy’ that the Indian government has embarked on with a new vigour over last few years and Malaysia certainly finding a special mention in the same. It may be herewith, hoped for a new volume which might enlighten the reader on some more such unmistakable points of reference for a subject of such importance and stature.